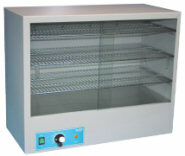 The GENLAB Drying / Warming cabinets are suitable for drying a range of items such as glassware and instruments and any general purpose warming applications. Models in this range include the DC125, DC250, DC500 and DC1000 for non-insulated and the IWC125, IWC200, IWC425 and IWC885 for insulated. The exterior is constructed from sheet steel finished in an easy clean powder coated paint. Fitted with adjustable shelf runners, removable plated wire grid shelves and ventilation outlets. The insulated range of units give far greater temperature control, allowing greater accuracy during the drying and warming process. The resulting reduction in energy requirements gives a performance saving of over 30% compared to the non-insulated range, which significantly reduces the running costs on these models, making them both highly efficient and very cost effective. The 125 and 250 litre models have sliding, toughened glass doors. 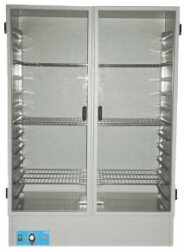 The 500 and 1000 litre models have hinged, toughened glass doors. Control is via a direct reading thermostat with calibrated scale and tamper proof lock. The units also have a mains switch with indicator and heat indicator. As an option an Extractor fan system can be fitted to the top of the 500 and 1000 litre units. This increases the throughput of air and reduces the overall drying time. Heated by Incoloy sheathed elements positioned in the base of the unit. The 500 and 1000 litre models have fan assistance as standard.